Today marks the 13th convention of Ink-nation here in the country. A gigantic, buzzing, full-on collision of the rarest breed of art, ink and passion. Years after years of celebrating and promoting the Tattoo Art, Dutdutan is ready to take it to another level. Dutdutan Trece is set to make another history as it goes bigger, badder and better, just like what it has been doing for past 12 years. What can we expect for this year's Dutdutan Convention, aka Dutdutan Trece? 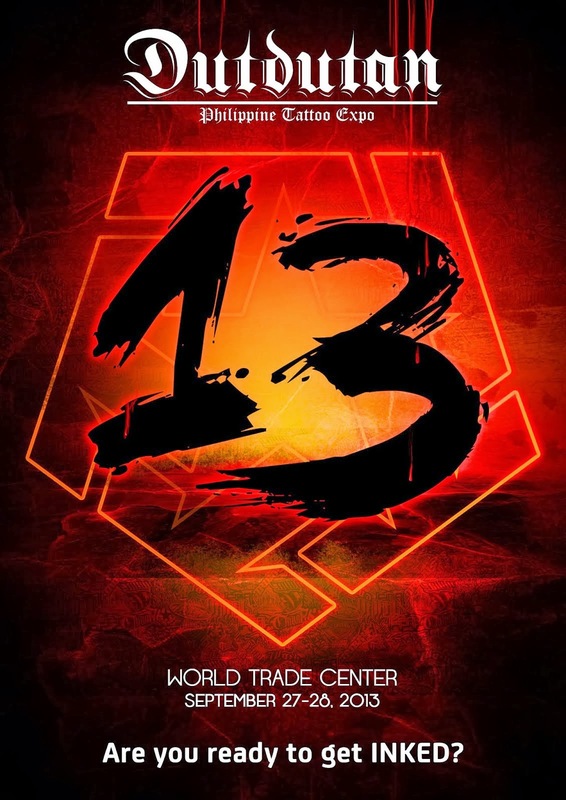 Well this is possibly the most extravagant tattoo event in the country yet, Dutdutan Trece is all set to feature and house thousands of artists, collectors, and ink enthusiasts. 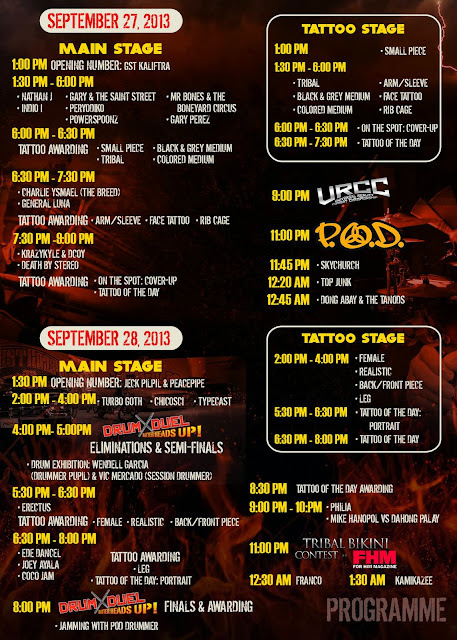 To make it more explosive, Tribal Gear Philippines, bring Big names in the Tattoo Industry, that will celebrate with us. From the likes of Unauthorized Ink’s infamous Big Tiny, to world renowned tattoo artist Steve Soto of Goodfellas Tattoo and main man, Tribal founder Bobby Ruiz. No guns no bullets, just drumsticks on this classic Drum Duel until they the he/she becomes the last Drummer standing. Be recognized and earn bragging rights. After all this is a duel only one is expected to win. 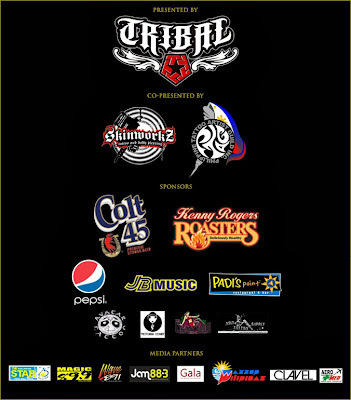 Sic' line-up of hottest bands in the scene Gen. Luna, Indio I, Skychurch, Dong Abay & The Tanods, Peryodiko, Franco, Chicosci, Joey Ayala and Kamikazee to name a few. Moshpit anyone? This will not be called a tattoo convention if there's won't be a contest. Different categories can be won by Tattoo Artists and their respective companies that they represent. This will be hard for the judges again as all of them are all gurus on this craft. Do you have any personal favorite among them? Take a glance of what will happen for this 2-day event to keep you guided. Reserve your weekend and get ready to get Inked! Catch the live action at URCC’s live combat fights! on Top of the fight arena a gigantic LED screen is setup to please even the ones afar from the stage. Different weight classes together with different fighting style and techniques will be showcased on these adrenaline-pumping fights. Over 100 plus different booths will occupy the event grounds that will house best local and international tattoo artists from all over the country and around the world. Together with these are memorabilias, from keychains to Shirts are available for purchase. If you are a tattoo artist yourself or planning to try this craft, this is the perfect spot as inks, guns, etc are plenty to choose from. Tribal Project: Detonation was launched last year as part of Dutdutan XII, since then it stills(pictures) taken from the event poured-in like crazy and keeps on flowing Dutdutan's fan page on Facebook. Some even got their free passes for this year's Dutdutan due to the huge amount of appreciation for their captured photos. We'll this is a surprise. You better be there to understand what we are talking about. No more spoilers, ok?! Check out the producers, co-presenters and media partners who made this enormous event possible. Once again, on its 13th year, enjoy and experience the exhibits, the music, the shows and the crowd at Dutdutan Trece. "Remember, other people hang their art. We wear ours."